Before we get into what’s so “special” about this Mesa, Let’s identify it. The Mesa LoneStar Special is a 35 watt, All Tube (quad EL84) vintage inspired amp with 2 channels. Either channel can be knocked down to 15 watts or 5 watts Class A, both of which take advantage of the tube rectifier as opposed to the solid state rectifier equipped in the highest wattage mode. All of that goodness gets pushed through either one or two Mesa/Celestion Blackshadow 90 watt speakers. Now, let’s get under the hood. Channel 1 will be a very familiar sound somewhere between a Vox AC30 and a Blackface. It delivers chime for days when set dead clean with a voice-able reverb that can really accentuate the sparkle when “bright” is selected. With proper use of the gain and master volume controls, and a little help from the 15 watt setting with the tube rectifier, you’ll be taken down south to your favorite blues pub sipping on your favorite whiskey and enjoying the tweedy break up while you play your version of Statesboro on a bottleneck slide (Whiskey not included with purchase). That’s channel 1: clean, simple, and full of tone. Now on to Channel 2. Channel 2’s roots lie somewhere around the birth of Mesa Boogie giving off a Mark II vibe at first, but that’s just the tip of the iceberg. Quite honestly, the imagination is the only limitation for this channel. It can be a carbon copy of the clean channel, should you choose to deactivate the “Drive” control. This allows you to set 2 separate channels in the ranges I described above, which I found to be very useful out live in conjunction with the built in Solo Boost or a favored clean boost. Click the “Drive” back in and now we have cascading gain between the Drive, Gain, and Master. On top of that, a voicing selector (Normal, Thick, and Thicker) adjusts the treble capacitor, and when in “Thicker,” can give an ever so slight gain boost so you can start to sound like Santana or dare I say, Dumble style tones. All of that control over one’s sound and not a word has been said about the EQ. Mesa’s EQ is quite reactive on most of their amps and some controls even serve secondary functions. Like I was saying… a tweaker’s paradise. Despite the Lonestar Special being feature-packed, this amp is pretty plug and play. 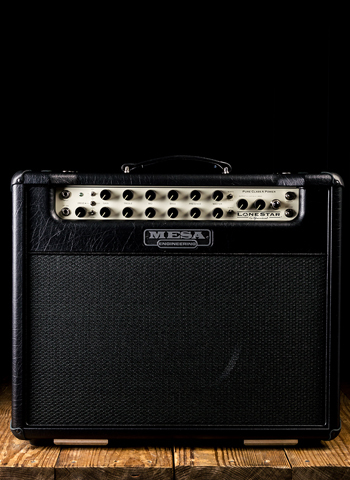 It’s as simple or as complex as you allow it to be, which can’t be said for most Mesa amps. I hear my old man in the back of my head yelling, “JUST READ THE MANUAL.” Thanks, but no thanks, Dad. This is an easy one. There are loads of cool quirks to learn about with this amp through the manual, but it’s not impairative to memorize. No offense to the Mark V (It’s a killer amp) but it looks like a space shuttle cockpit. The Lonestar takes a much more refined, streamline approach. The Lonestar Special is perfectly capable of being a clean platform for pedals, which to me, is the single biggest difference between the this amp and the rest of the Mesa line up. The clean has more depth than any other amp out there in its price range and size. Before I met my Lonestar Special, a typical rig was a blackface amp and lots and lots of pedals, and I loved the simplicity and how adaptable those amps could be. Well, I’m telling you the LSS does it better. It just does. It’s never harsh at any volume. The cleans aren’t sterile. They’re warm and react great to my heavy attack (and I mean HEAVY) without the “ice pick” I hear in most modern amps. Also, my Carbon Copy Delay, Deja Vibe, and Rotochoir sound gorgeous through that effects loop. I really encourage everyone to at least give this amp a shot. Especially if you’re a vintage guy but are still searching for something and haven’t landed on it. THIS IS IT! I don’t feel like I’m going too far by saying this amp has changed my musical life on-stage and in the studio.